It wasn’t the most auspicious start to a three-day summer holiday. With Campbell in England at his Granny’s, the band I manage off on tour, and the weather forecast calling for lovely late summer temperatures, the wife and I had made an impromptu decision to revisit the Finger Lakes. The scene of a disappointing encounter last October when Saturday crowds and autumnal rains had made for a tough day of winery visits, we’d nonetheless opted to give it a second chance. Now, after booking a hotel rather than a B&B so as to avoid guilt at carrying with us a potentially noisy baby; after a five hour drive along boring highways and through poor rural towns; after a ride through Nascar capital Watkins Glen, its streetside motels fronted with white working class race fans downing six-packs of cheap beer… we pulled up at the Best Western in the town of Penn Yan and tried not to vocalize the sinking feeling in our stomachs. The hotel, which had looked so pretty on its web site, turned out to sit on one corner of a five-way intersection. The other corners were marked out by, respectively, a Pizza parlor, a McDonald’s, a Chinese diner, and a derelict lot. There was no sight of supposedly adjacent Keuka Lake, and the main road ahead of us was dotted primarily with gas stations. At check-in, though the reception area was lined with bottles of local wine, I was informed that there was neither a bar nor restaurant on site, and handed instead a folder full of local menus, most of which were for fast-food joints, pubs, or diners. It looked like we were about to spend a well-earned mini-vacation slumming it. Just one hour later, and we were on the outdoor deck of the Inn at Glenora Wine Cellars, catching the last of the day’s rays as we gazed eastwards over Seneca Lake, a glass of wine in front of us both, and a beaming Noel toddling happily from table to table like a puppy basking in affection. No, we had not checked straight out of the Best Western. Rather than complain about the hotel’s location, or its lack of restaurant and bar, we’d celebrated our room’s size (near enough a suite), location (at the end of a corridor where it would be hard for baby Noel to disturb others), and its supply of free broadband and cable TV. We’d then dusted ourselves off, got right back in the car and embarked on a brisk 20-mile drive through endless corn fields for our dinner. The cup of life, my friends, should rarely be perceived as half empty, and when you’re in wine country, it should always be half full. On our previous trip to the Finger Lakes, we stayed in Trumansburg. 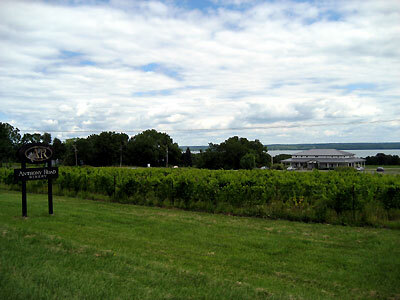 This time, the Penn Yan location proved ideal for visiting wineries on the west side of Seneca Lake and all around Keuka. By Finger Lakes standards, Glenora Wine Cellars is old school, the Pierce family having opened the winery back in 1977. 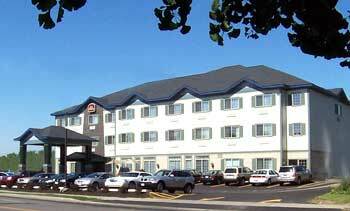 The decision to construct a modern, upscale motel-style Inn and a restaurant on the grounds, overlooking Seneca Lake, is decidedly new wave, however, a perceptive reaction to the region’s increased tourist trade and accompanying demand for better food and accommodation. Certainly, the restaurant Veraisons is full of promise. I was delighted to see, on top of the menu’s entrees list, a vegan Phyllo Vegetable Turnover (“Fresh vegetables mingled with Jasmine Rice wrapped in Phyllo Dough, laced upon Cajun Fried Potatoes with a pool of warmed Tomato Margarita Salsa and chilled Salsa Verde”) that, like the other main courses, came with a choice of gourmet salads, and for only $15. Both Posie’s Peach Orchard Salad (“Fresh baby greens with mandarin oranges, dried cranberries, Red Delicious apples and candied pecans tossed in Honey-Peach Passion Mignonette”) and my Chipotle Caesar Salad (“Chiffonade of Romaine lettuce tossed with Chipotle Caesar dressing, black olives, plum tomatoes & shredded Parmesan cheese. Served with Parmesan Ciabatta croutons”) were excellent. The clash of ingredients was nonetheless unsettling on the stomach, the chef having erroneously convinced himself that the more flavors he could blend into a dish, the better it would be. These were also difficult matches for wine: what do you choose to go with a “tomato margarita salsa” or “black olives and plum tomatoes”? Answer: you wing it. Posie settled in with a glass of Glenora’s NV Brut “Methode Champenoise”, which had a pleasant enough citrus-grapefruit thing going on, but was a little heavy up front and somewhat awkward at the back. (And at $25 a bottle, not worth the few dollars in savings over real Champagne.) Heading straight for the Finger Lakes signature drink, I ordered a Glenora Dry Riesling from the heralded 2005 vintage, but was disappointed by its tart nature and, again, overly citrus flavors: where were the apples and pears one typically finds in a classic Finger Lakes Riesling? As our food arrived, we delved deeper into the wine-by-the-glass list, Posie choosing a 2005 Glenora Chardonnay that was equally tart, acidic and disappointing, while I braved a 2004 Glenora Syrah. I say “braved” because I consider Syrah perhaps the greatest of all the noble red grapes, yet it remains an entirely unproven quantity in the Finger Lakes. Though I couldn’t convince myself I was drinking a Syrah as much as I could make believe that this was a particularly peppery Cabernet Franc, stil I was modestly impressed by the wine’s blueberry nose, dark berry flavors and spicy finish. Later in the week, at a wine store, I noted that Glenora produces 1.5 Liter “jug” versions of its Riesling and Chardonnay, and that this was most likely what we’d been served for the modest dinner table price of around $5 a glass. But it’s hard to be sure: while I repeatedly asked our waiter to let me know what vintages I was drinking, and while he repeatedly promised to inform me, I ultimately had to ask the bartenders for myself. It’s hard, perhaps, to get great service in a relatively remote region not yet known for its fine cuisine, but it will be needed if Veraisons, or any of the other new restaurants in the region, want to put the Finger Lakes on the culinary map. In the meantime, we’ll settle for the modest price of $83 for a meal that included two glasses of wine each, two courses of food and a dessert for myself. I’d return to Glenora any time for the view and the ambience. But, based on the mediocre wines, we didn’t return to the actual winery. 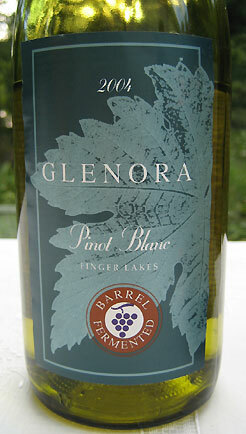 Later in the week, however, I did pick up a bottle of the 2004 Glenora Pinot Blanc for $12 to see what a Finger Lakes producer might choose to do with this relatively innocuous grape. In Glenora’s case, they barrel fermented it, placed a big sticker on the bottle advertising as much, and, I guess, hoped that it would appeal to those casual wine drinkers who believe that oak is the saving grace of every crushed grape. Subsequently opened over dinner with friends, this Pinot Blanc was actually not too shabby: a light citrusy, vanilla aroma giving way to a bright wine with a little orange flavor around the edges. The oak was not overwhelming, leaving the drink, as befits the Pinot Blanc grape and typifies Glenora’s output, relatively simple. Glenora wines: simple. And in this case, pleasant too. Late the following morning, under comfortably sunny skies, we got on our bikes (Noel on his own seat behind Posie), and headed to the western edge of Seneca Lake for a proper work-out of both legs and lips. Our first port of call was Anthony Road, a well-regarded if not necessarily well-known winery located along Route 14. We found a comfortable tasting room, where samples of up to five wines cost a completely nominal one dollar, and where kids (babies included) are readily entertained with toys, drawing materials and (non-alcoholic) grape juice. 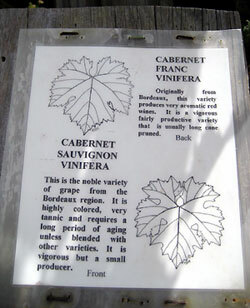 Outside, a garden of flowers, fruits and herbs entices one to relax, while rows of labeled vines encourage visitors to learn the difference between, say Cabernet Sauvignon and Cabernet Franc grapes, or Riesling and Chardonnay. Wine-maker Johannes Reinhardt was seen wondering around in his big rubber boots: his family has been making wine in Germany for almost 600 years, which bodes well for his emigration to a region that is itself decidedly Germanic in climate, rivaling the Mosel for perfect Riesling conditions. Anthony Road looks over Seneca Lake, and offers a delightful garden to explore. Time, then, to get stuck into the wines. And especially, to sample properly from the 2005 vintage, a year that produced a limited crop of reputedly excellent grapes, a blessed relief after the hardships of 2003 and 2004. The 2005 Anthony Road Chardonnay was made without oak and lacked much by way of color, the winery suggesting on its tasting notes that the aroma was almost like that of “fresh air.” While asking myself whether fresh air qualifies as an aroma, I noted that the palate offered up a sharp taste of Granny Smith apples, and that the wine was good and bright on the palate, a solid example of a clean, well-made, acidic east coast Chardonnay. The 2005 Dry Riesling was also clear in color, but perfectly redolent of the grape, with apples and pears balancing a good citrus mouthfeel. Clean, pure and vibrant, and well worth its $13 price tage, I nonetheless noted that it was “Perhaps not classic” – probably covering my bets given how many more 2005 Rieslings I intended to taste over coming days. And, of course, the beauty of Riesling is that it can be made in so many “classic” styles, from bone dry through to luxurious, decadent and forbiddingly expensive dessert and ice wines. Somewhere in the middle of all this is the Semi-Dry Riesling, a potentially marvelous table wine that appeals to the casual drinker with a sweet tooth and to the wine connoisseur alike, and which serves as a marvelous accompaniment to all manner of foods, from shellfish and rich meats to curries. I was very taken by the Anthony Road 2005 Semi-Dry Riesling, with a relatively subdued 1.2% Residual Sugar; packed in an impressively sturdy bottle, its apple and pears flavors were matched by floral touches and lip-smacking lemon/grapefruit tinges, a pure and pleasant wine with a crisp apple finish. Just $13 for true quality, it was one of the bottles we brought home with us. Reinhardt is on a real roll with his Rieslings. In addition to his work at Anthony Road, he has teamed up with Peter Bell from Fox Run and Dave Whiting from Red Newt to make a Riesling entitled Tierce. This concept of collaboration between competitors is quite common in the wine world, where friendships bloom among like-minded neighbors who often decide to then blend each other’s grapes and resources. The 2004 Tierce Riesling is bone dry, with a much more powerful nose than Reinhardt’s own Rieslings; a little mean and green on the attack, it soon settles into a long, pure finish. It’s made, as you’d expect, in limited quantities at a hefty price ($30), and I passed up the opportunity to buy a bottle, though I look forward to sampling the same wine from the superior 2005 vintage. In the meantime, October 2006 will see the debut of Reinhardt’s third Riesling label, a select brand named for himself and his business partner at Anthony Road, The Martini-Reindhardt 2005 Selection Riesling, just off-dry with 1.8% RS, will retail for $26.It was not yet available to taste. Anthony Road labels rows of vines outside the tasting room, so visitors can learn the difference between specific grapes. Now that Riesling has been accepted as the Finger Lakes’ signature wine, local producers are on a quest to discover the region’s next great white grape. Chardonnay is too universal; Pinot Blanc, as already observed, is somewhat anonymous; and while Gewurtztraminer is an obvious candidate for the Finger Lakes climate, it’s something of an acquired taste. Pinot Gris, on the other hand, is a wine on everyone’s lips (albeit in its Italian name of Pinot Grigio), and perfectly well suited to the region’s cool conditions. No surprise, perhaps, that the winery was sold out of its latest vintage already, though I was able to find some both at local wine stores and at a restaurant. I’m glad: the 2005 Anthony Road Pinot Gris has an almost luminescent golden color, and its relatively muted nose (not atypical for the grape) quickly gives way to a deliciously ripe, rich body full of luscious tropical fruit and mineral stone notes all in perfect balance. It’s not up there with the Trimbach Pinot Gris from Alsace of which we’ve been raving chez Fletch, but it’s a damn good imitation and at a very good price, around $17. If you see it, you should buy it. A 2005 Martini-Reindhardt Selection Pinot Gris will be available in October. Given the quality of the everyday bottle, it could well be worth its $23 price tag. As befits a German wine-maker, Reinhardt eschews red wines (apart from a non-vintage kitchen sink blend of hyrids and vinifera). Pouring all his attention instead into white wine, he makes, in addition to the Riesling, Chardonnay and Pinot Gris, a 2005 Semi-dry Vignoles, arguably the most “noble” of white “hyrbrid” grapes, and which in this table wine version has classic peach and pineapple aromas. I preferred it to the more popular dessert Vignoles, which is called, a little too commercially, Sweet Dream. With Residual Sugar of 10%, Sweet Dream has that classic, somewhat cloying texture that leads the Australians to call these wines “stickies.” Finally, there’s a 2004 Martini-Reinhardt Selection Vignoles Trockenbeeren which retails for the intimidating price of $75 for a half bottle. (A taste at the winery is an equally prohibitive $5; I passed it up.) At an over-achieving winery which strives to keep things natural, you’re apparently paying for the fact that the grapes are crushed by feet. Two excellent Semi-Dry Rieslings from the 2005 vintage. To confuse matters, the Fox Run wine does not label itself Semi-Dry: you’re meant to assume the difference from the fact that they have another Riesling more precisely marked as Dry. If Anthony Road is the cult hero of west Seneca Lake, then Fox Run, a mile’s bike ride up the road, is the people’s choice. It is in many ways the quintessential Finger Lakes winery, with a large café, an even larger tasting room, and commercial guided tours of the grounds. As then befits a winery that expects casual visitors alongside connoisseurs, the wine list ranges from the noble – Riesling, Chardonnay, Merlot, Cabernet Franc – to the comical, wines with names like Sable and Arctic Fox. Confirming that old adage that no one ever went broke underestimating the general public, the Arctic Fox, a semi-sweet picnic style white blend that retails for just $8, is the winery’s biggest seller. For those of us who prefer quality over quantity, the unoaked NV Chardonnay, at just $10 a bottle, proved clean and unspectacular. The 2004 Reserve Chardonnay, at $15 a bottle, was uncommonly ambitious, its 10 months’ oak aging showing in buttery, ripe apple flavors. Spicy and opulent, it could have passed for Californian; whether that’s a good thing or not is a matter of taste. The 2005 Dry Riesling is solid and distinct, with some interesting apricot flavors coming through the perfumed nose, but it’s difficult to justify the $20 price tag. Better to jump down the price scale to the $13 2005 Riesling which, though it doesn’t say as much on the label, is in fact a Semi-Dry, with 2.1% RS, some pineapple touches, good acidity, a certain stoniness, and a solid finish. That ‘stoney’ quality is a flavor I find in good Finger Lakes Rieslings, as if I can visualize crystal-clear wine washing over clean pebbles as it makes its way down a mountainside. (Hey, everyone has their personal wine reference points, and this is one of mine.) A truly excellent Finger Lakes wine at a truly sensible price. 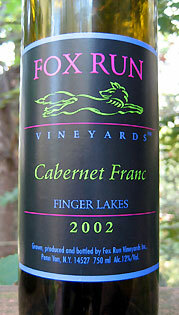 The Fox Run Cabernet Franc 2002: a friend of mine quickly declared it his new favorite wine. Of Fox Run’s reds, I was pleased to see some 2002 Cabernet Franc still on sale. Cabernet Franc, as you’ll know if you’ve been following my regular wine dispatches over the years, is by far the best-suited red grape for the north-east coast’s climate, and 2002 was the last decent year in the Finger Lakes – at least until the highly-hyped but as yet unproven 2005 vintage. This particular example had a tannic nose that led into a very pure, somewhat cedary wine full of spicy flavor, still loaded with tannin and equally packed with dark fruits. We brought a bottle home with us and opened it for visiting friends; while I thought the wine itself was hiding behind an oak curtain, my wine-loving dinner partner pronounced it his new favorite wine. But that’s the thing about Cabernet Franc: it’s so easy to love. I look forward to turning him on to even better examples. Though I admit to being something of a wine snob, I was caught stupid by a bottle of Fox Run 2004 Lemberger. Lemberger, I was informed, is a red grape particular to Austria, which would explain its sudden presence in the similar climate of the Finger Lakes, especially as producers in the Lakes are finally abandoning the hot climate grapes Cabernet Sauvignon and Merlot and instead scrambling to find cool climate red grapes to rival Cabernet Franc in quality and prestige. Upon coming home and doing my research, I learned that Lemberger is the same grape by a different name as Blaufrankisch, which I have previously sampled and written about in its Austrian form. From this first impression (and a second one the next day at Keuka Spring), Lemberger works well in the Finger Lakes wine. The fruity nose fell somewhere between Gamay and Syrah, and while the palate offered up some of the pencil/pepper/tobacco one typically expects from Finger Lakes Cabernet Franc it was, if anything, even more spicy and fruity. The $18 bottle price is about right for a quality Finger Lakes red; I would have bought a bottle home except that, being on bikes, we’d already planned to do my wine shopping in town. The Fox Run web site notes now that the 2004 Lemberger is gone: as with the 2005 Anthony Road Pinot Gris, it’s reassuring to see the best and most interesting new wines selling so fast. 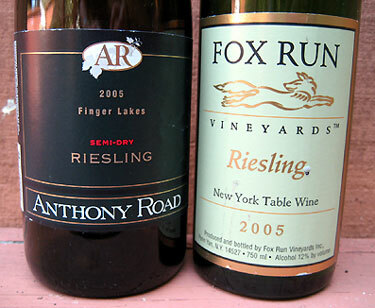 And just as Anthony Road excels with its white wines, Fox Run would appear to be a reliable resource for reds. We left Fox Run mid-afternoon with the sun still high in the sky, with two successful visits under our belts, and without having to worry about a designated cyclist. The previous trip to the Finger Lakes was already a thing of the past. Tony, I just came across Part 3. I’m glad you fared better this time. Anthony Road & Fox Run are definitely quality producers. 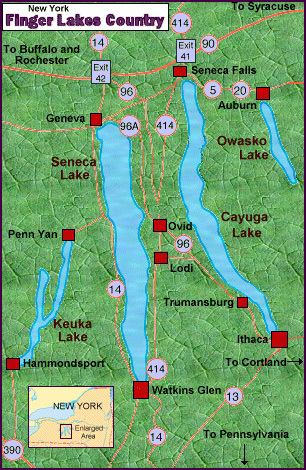 Email me next time you are coming to the Finger Lakes and maybe we can meet up for a glass or two.